We are engaged in offering a wide range of Refrigeration Air Conditioning Lab Trainers to our esteemed clients. Designed for suiting variegated clients requirements. The Vapour Compression Refrigeration test rig works on simple vapour compression refrigeration cycle and uses R134a as a refrigerant. It is environment friendly. The system is fabricated such that students can observe and study vapour compression cycle, its component principle & working. The arrangement of parts such that, all the parts are visible and working can be easily understood. Compressor : 1/4 HP; Hermetically sealed. Make: Emerson Climate Technologies Ltd. /or Danfoss Ltd;/or Tecumseh Products India Ltd./ or any equivalent make. Condenser : Forced convection air cooled. Accumulator : Copper / M.S. shell suction line accumulator provided. HP / LP Cut-out : Alco/ Danfoss / Castle or equivalent make. Pressure indication : 2 nos. dial type pressure gauges; one for suction and the other for discharge pressure. Temperature indication : Multi-channel LED digital temperature indicator. Refrigerant flow indication : Glass tube rotameter. Input power : 1.0 kW. Rated current : 4.5 Amps. Indicating lamps : Provided for compressor. Energy-meters : Provided for compressor. Calorimeter : Stainless steel: SS-304 tank with nitrile foam insulation. 1. TO STUDY VARIOUS COMPONENTS AND CONTROLS USED IN VAPOUR COMPRESSION CYCLE. 2. To evaluate the tonnage capacity of the air conditioning system by enthalpy difference method. 3. TO EVALUATE ACTUAL & THEORETICAL C.O.P. OF VAPOUR COMPRESSION CYCLE. 4. TO PLOT ACTUAL REFRIGERATION CYCLE ON P-H CHART. Rating conditions * : Ambient temperature= 350 C, atmospheric pressure = 1.01 bar, suction pressure=35 psig, discharge pressure= 180 psig, evaporation temperature=7.70 C, discharge temperature=550 C.
From the first day of our inception, we have been able manufacture and supply the optimum quality of Ice Plant Test Rig. The ice plant test rig is ideal of understanding the processing and functionality of vapor compression systems. 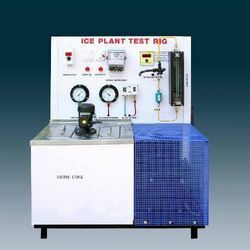 Besides this, the offered ice plant test rig is available with us at cost effective prices. The Ice Plant Test rig works on simple vapor compression refrigeration cycle and uses R134A or R404A as a refrigerant. These are environment friendly. The system is fabricated such that students can observe and study ice formation process. It is also useful to understand working of vapor compression system, its performance and controls used. The arrangement of parts such that, all the parts are visible and working can be easily understood. For meeting and managing the precise needs of our patrons, we offer the best quality of Water Cooler Test Rig. Manufactured by using latest technology, the offered test rig is used for studying and understanding different types of water cooling systems. 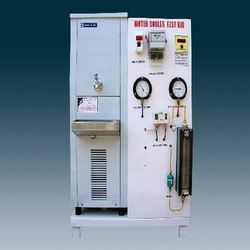 Our patrons can avail the offered water cooler test rig is different specifications. 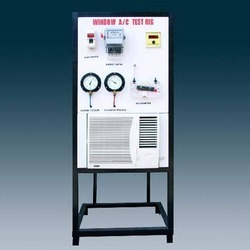 The Window AC test rig is designed and manufactured such that the students can understand construction and working of a window type air conditioner and conduct the trial on it to evaluate performance of the same. The window AC is fixed in a rigid angle frame, with its cover cut half open to reveal the internal parts of the AC. The required pressure and temperature taping are drawn for measurement of pressures and temperatures at salient points. Energy meter is provided for recording compressor energy consumption. A sling psychometric is provided for measurement of inlet and outlet Dry-bulb & wet bulb temperature. With the help of manometer, velocity of air and consequently the flow rate of air can be determined. As a noteworthy entity of this domain, we have been able to manufacture and supply the premium quality of RAC Display Board. 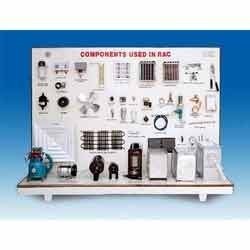 Manufactured as per the industry laid norms and regulations, the offered RAC display board is used in various refrigeration systems. Rendered by us at cost effective prices, the offered RAC display board is known for its thermal stability and robust construction. The display board consist nearly all the components used in refrigeration system. The arrangement of parts such that, all the parts are visible and the construction can be easily understood. The components are mounted rigidly on the wooden/powder coated steel frame. Nomenclature helps to identify each component. 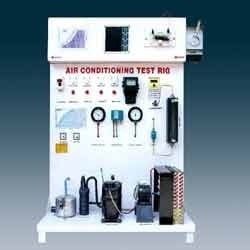 We are counted as one of the leading manufacturers and suppliers of the best quality of Air Conditioning Test Rig. 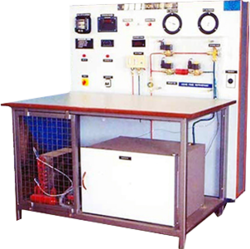 Designed in accordance to the needs of our patrons, the offered test rig is ideal for understanding the working, performance and control of various air conditioning systems. In addition to this, the offered air conditioning test rig is rendered by us at cost effective prices. Looking for Refrigeration Air Conditioning Lab Trainers ?